[Read by Adam Verner]<br /><br /> <i>Ten Prayers That Changed the World </i>delves into the moments in history when faith and prayer intersected with the course of mankind.<br /><br /> From time immemorial, prayer has provided comfort, stirred us to action beyond what we thought possible, and shown us the way through seemingly insurmountable challenges. 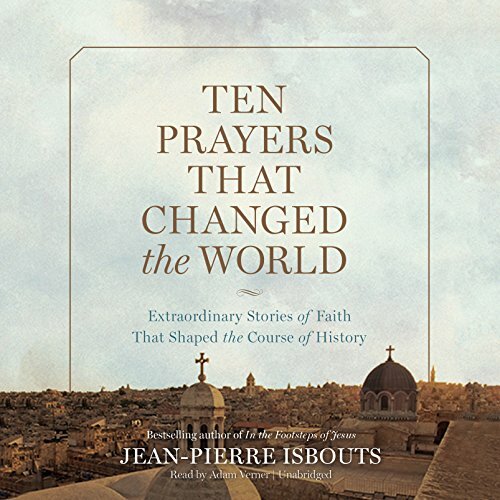 In this engaging tour of world history, author and historian Jean-Pierre Isbouts takes us on an inspiring tour of ten prayers that played a pivotal role in world events. These range from the divine inspiration of Joan of Arc to Martin Luther's hymn ''A Mighty Fortress,'' from George Washington's prayerful words to the newly formed American states to the horrors of Auschwitz, and from Constantine the Great's prayer before battle to Gandhi's deeply moving prayer of peace. <b>JEAN-PIERRE ISBOUTS</b> is a bestselling author, historian, and award-winning director of documentary and feature films. A humanities scholar and professor at Fielding Graduate University of Santa Barbara, California, he has published widely on subjects in art, history and archaeology, and directed films for Disney, ABC, Hallmark, History Channel and other studios and networks. He has also produced a broad repertoire of classical music with ensembles in New York, Los Angeles and Amsterdam.